This chapter draws on visual narratives imaginative and performative capacities and the role of metaphor in representing self when making art. The chapter will present the theoretical underpinnings of two visual artmaking projects where the participants used artmaking as a memory space to hold experience when remembering and reflecting. The artmaking taps into time and memory, aesthetic experiences and imagination as they underpin the visual narrative journeying experiences. 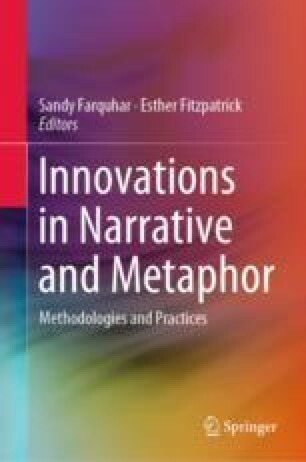 The chapter will describe the innovative visual narrative methodologies and reveal the power metaphor has in building narratives of resistance and in the support of narrative remembering. Both innovative methods seek to use artmaking as a platform to provide positive ways that can assist to help reconcile the present, imagine the future in the management of change for personal agency and in remembering self. The first study focuses on narrative and artmaking for well-being. It describes the arts-based methods through the artworks and voice of one participant. The second study on ‘memory books’ is told through the reflective lenses of the art therapist and the facilitating art students. Popova, Y. (2014). Narrativity and enaction: The social nature of literary narrative understanding. Frontiers in Psychology, 5, 895. https://doi.org/10.3389/fpsyg.2014.00895. White, M. (2011). Arts in health: A new prognosis. https://medicalhumanities.wordpress.com/2011/03/13/arts-in-health-%E2%80%93-a-new-prognosis/. Accessed February 16, 2018.